My chaeto keeps turning white in my sump, and I have replaced it 2 times already. I was tired of it turning white despite dosing nitrate and feeding a lot. I even upgraded my sump light to the overpriced IM Chaetomax so it's not a lighting issue but supplement issue. I also tried Seachem Flourish but it has copper so I was dosing very very sparingly. I finally bought ChaetoGro supplement by Brightwell Aquatics and within 1 week, my chaeto went from almost white and disintregrating to green and strong. I was amazed so just want to pass this along. Not sure if this is a new product from them since there aren't a lot of reviews out there. "ChaetoGro contains iron, cobalt, molybdenum, and many other elements that algae require for vitality". I think those other elements have helped my other corals look even better too. Thanks for this tip. My chaeto grows really great for a while, then it turns white and seems to die back some. I need to see if this will help my growing rate. Didnt think you could have problems with Chaeto... I dont think you even need expensive lights for it... you do need good flow. I have to prune my reactor every 2 weeks because a golf ball turns into a football, and this is off 12 dollar amazon hydroponic strips even. This is how it looks like when its close to prune time.. I do notice the part directly under the strip does turn white... so i have like a white spiral down the entire cheato. But meh, it gets pruned and i dont see it so it doesnt really bother me. Looks cool. have more info on the setup? Hmm I gave up on chaeto because of the same problem. 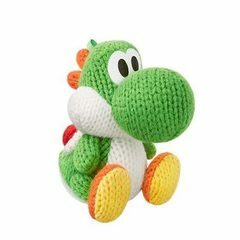 Maybe I'll pick this up and try it out again, thanks for the tip! How long have you been using the supplement for? Any nuisance algae increase? Been about 3 weeks now. I do not see any noticeable increase in algae in my display tank, but I always have a bit of algae in display because I been running higher nutrients. Its just a simple media reactor with the sponges removed and then stuffed with chaeto wraped with hydroponics light strip. I mostly use the chaeto as a secondary filter with my protein skimmer, and also as a copod dump. Each time i prune the chaeto from the reactor, i do give it a good shake inside my sump, prune it a golf ball size and then toss the rest. 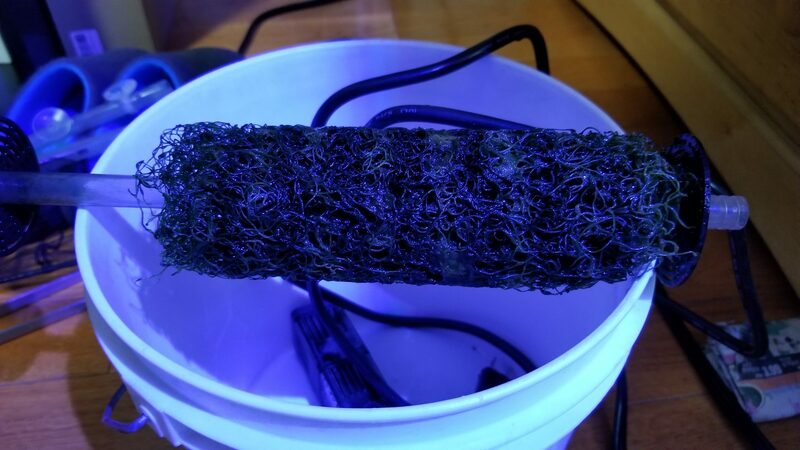 With this pump because i needed a sponge in front instead of inside the media reactor so i don't trap my copods growing in it, i guess you can run it filterless, but then your chaeto will probably get dirty faster if it picks up detritus. 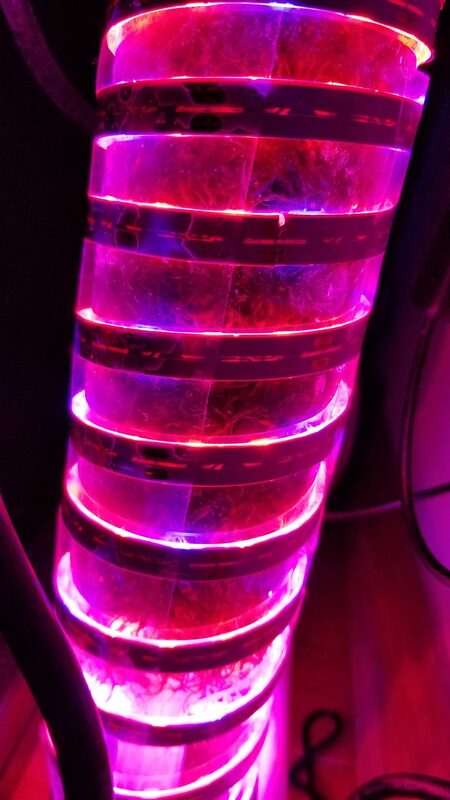 Since the light strip is literally wraped around the reactor, it cools the strip so the led's dont burn out, but it may increase your water temp if the tank is small. I used to run a refuge, but i only have a 14 gallon sump where only half of it is full. After i threw in a protein skimmer, and a media reactor for GFO and carbon, i realized i didnt have enough room for a refug, so i am running the chaeto though a second reactor. On my next Prune i'll post pictures, but im fairly sure, unless you got super prestine water where no macro's can grow, i have yet to see someone fail at growing chaeto though a reactor. I do also keep my lights on 24:7 in the reactor. Cool setup! Seems like a good solution to adding space. I'm running my fuge 24x7 currently and it keeps my nitrates at 0, constantly. definitely limited in that regard. yeah i was doing that also, but the light bleed caused algae to grow all over the place in my sump including my skimmer. This way i can keep my sump dark, which means less cleaning required for my sump, and definitely no algae growing in my skimmer. Good point. currently i have a couple rogue snails that seem to be keeping glass surfaces clean. my "sumP" is just an AIO chamber of the evo13.5. This is how it looks when its ready to prune. As you can see the area's directly under the strip is sort of washed out. I will pull that off the rod, cut and keep about 1/6th of it, and then throw it back in the reactor and repeat every 2 weeks. Reactors are easy to setup, and easy to maintain, and i dont think ive read on any forums where people have had problems growing cheato from them, unless they had problems growing all macros in general. I do notice i have faster cheato growth in a reactor then i did in a refug. I am guessing because of the more even distritubtion of light across the whole mass and better flow though the entire thing.